On the surface, debt relief sounds straightforward. After all, what more is there to interpret other than debt relief relieves your debt? However, after a quick Google search on the topic, you’ll likely be left with more questions than answers. 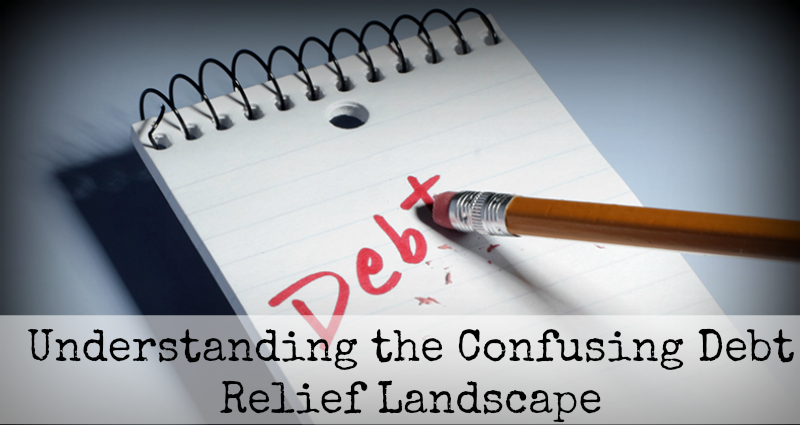 To cut through the noise and get a clear understanding of what debt relief is and how it can help you, keep reading. Many people are unclear about what debt relief means because it’s actually an umbrella term used to describe several types of strategies for managing, reducing, or eliminating debt. Debt-relief measures include debt management, debt consolidation, debt settlement and even bankruptcy. These options range from mild to severe, which is why deciding to engage in debt relief is only the first step. More specific information about a debtor’s financial situation needs to be examined before an appropriate action plan can be determined. Debt Management – An option for debtors who need to find more efficient ways of reducing their debt but can still make their payments. Debt management programs involve working with a company to pay debts on your behalf, often through lowered interest rates or waived fees, but you’ll also pay a monthly fee to the debt management company. Debt management certainly won’t help your credit score, but it won’t destroy it like other debt-relief options, either. Debt Consolidation – Debtors with many types of debt might call their creditor and try to consolidate several credit cards via a balance transfer to one card with a lower interest rate. If that doesn’t work, then there are debt consolidation loans as well. In general, debt consolidation—assuming you’re able to pay down the principle faster—is kinder to your credit score down the road. Debt Settlement – Debt settlement is a more severe measure that involves working with a company that attempts to negotiate with your creditors to settle a percentage of unpaid debt. Debt settlement will hurt credit score, can potentially end up costing more than an original debt sum and if successful, may bring tax costs with it. However, for debtors with insurmountable debt, settlement can provide a new path to financial health, and in as little as 24-48 months. Further, unlike debt consolidation, debt settlement is an option for all debtors regardless of their credit score. Bankruptcy – Another drastic measure is declaring personal bankruptcy via Chapter 7 or Chapter 13. Chapter 7 bankruptcy can erase all unsecured debt as long as you don’t have much income, but you’ll lose all your assets, and your credit score will be shot. Chapter 13 allows debtors to keep their assets, whether they have unsecured or secured debt—as long as they can stick to a repayment plan for 3–5 years. Both bankruptcy options will include filing fees, financial management courses and attorney costs. Where the debt-relief landscape becomes tricky (particularly for debtors looking for debt settlement options) is when conducting research. There is a lot of negative press about the debt settlement process, and for good reason: many illegitimate companies pop up targeting stressed and overwhelmed debtors into paying fees to resolve debt that’ll never be resolved. When evaluating debt relief and settlement providers, you should be looking at things like accreditation, positive reviews, company track record, and perhaps most importantly, whether you are a viable candidate for their service. Accreditation and Reviews – The Better Business Bureau (BBB) is the key site to look at for checking accreditations and reviews, but the American Fair Credit Council (AFCC) is another important accreditation debt settlement providers should hold. Track Record – Make sure a company isn’t a newbie to the industry and has settled a substantial amount of debt through various settlement cases. For example, a quick search for “what is Freedom Debt Relief” shows that the company’s been in business since 2002 and has helped more than 500,000 customers resolve over $8 billion in debt. Do You Qualify? – Not all debtors qualify for debt settlement services, and each company has slightly different qualifications. Some will only work with a certain threshold of debt, $5,000–$7,000 usually being the lowest amount a company will handle. Debt settlement, like bankruptcy, is a last-resort option for debtors without a way out. If buried by insurmountable debt, debt settlement can provide an eventual path toward financial health. It just won’t happen overnight, and your credit score will be battered for a number of years. 2009-2019 Mommy's Hangout All rights reserved. copyright laws are strictly enforced and NO content may be removed without permission or penalty of law. On your free time be sure to check out these sites!